Nottingham Evening Post Report – December 1994: Flood hit families were on the alert for more heavy rain today after muddy water from a nearby dyke flowed into their homes. The families in Woodborough spent most of yesterday [December 1994] mopping-up but kept a wary eye on the skies following [weather] forecasts of more rain to come. Homes along Main Street were worst hit by the deluge in the early hours yesterday. The ground floor of the house Jane Turner has lived in [142 Main Street] for 38 years was flooded by eight inches of water. Miss Turner, said her garden had been flooded at least twenty times before and her home has been swamped on four occasions in the time she has lived in Woodborough. 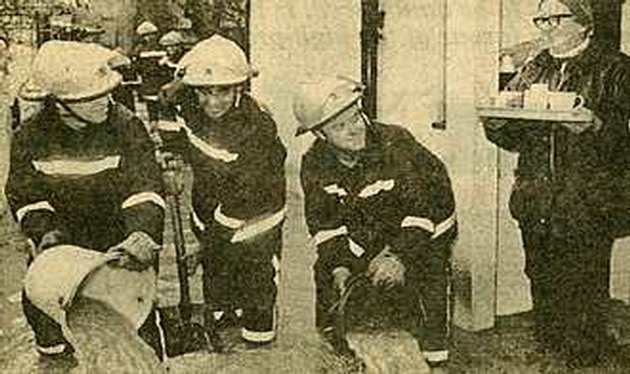 Left: Fire crew pumping out Jane Turner’s cottage, Jane serving tea. 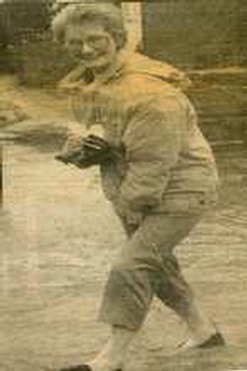 Right: Doris Round, landlady of Four Bells Inn wading through flood water. Fire crews had to use special low level equipment to pump the water out and they reached the limit for this equipment to get rid of the water affecting Miss Turner’s property. “The Fire Service spent more than four hours pumping the water from more than 20 homes”, said an Arnold Sub-fire officer. He added: “When we arrived the road was flooded for about half-a-mile. The water was about 18 inches deep in some parts”. Water gushed into the street from a dyke next to the Co-op and streamed down the road over drains which couldn't take any more. Article and photographs reprinted by courtesy of the Nottingham Evening Post.